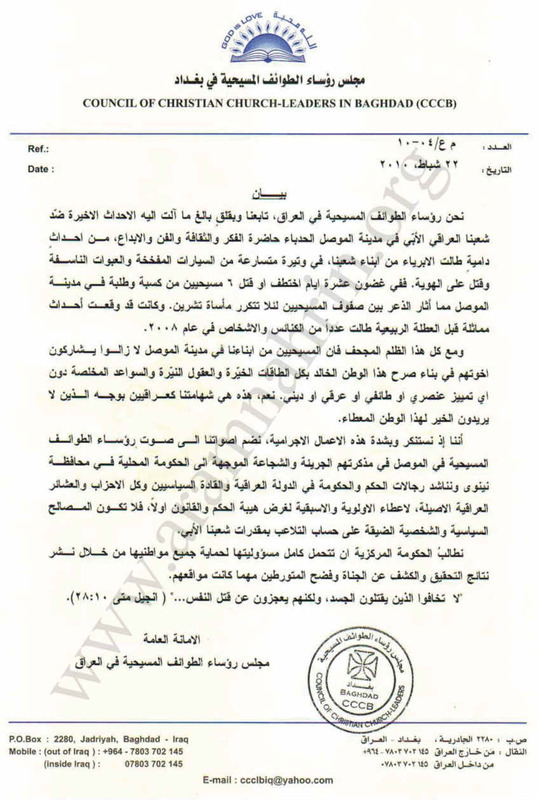 Council of Churches in Iraq appeals to the government to protect the Aramean people in Mosul, Iraq. The Council of churches in Iraq was established on 9th of February 2010 in Baghdad in the Armenian monastery St. Garabed. The Chairman of the Council is the Armenian bishop Avak Asadourian and the Secretary is the West- Aramean Syrian Catholic bishop Baelius Qas Moussa. According to the press release issued on 10th of February 2010, the council consists of 14 recognized churches in Iraq (see below). 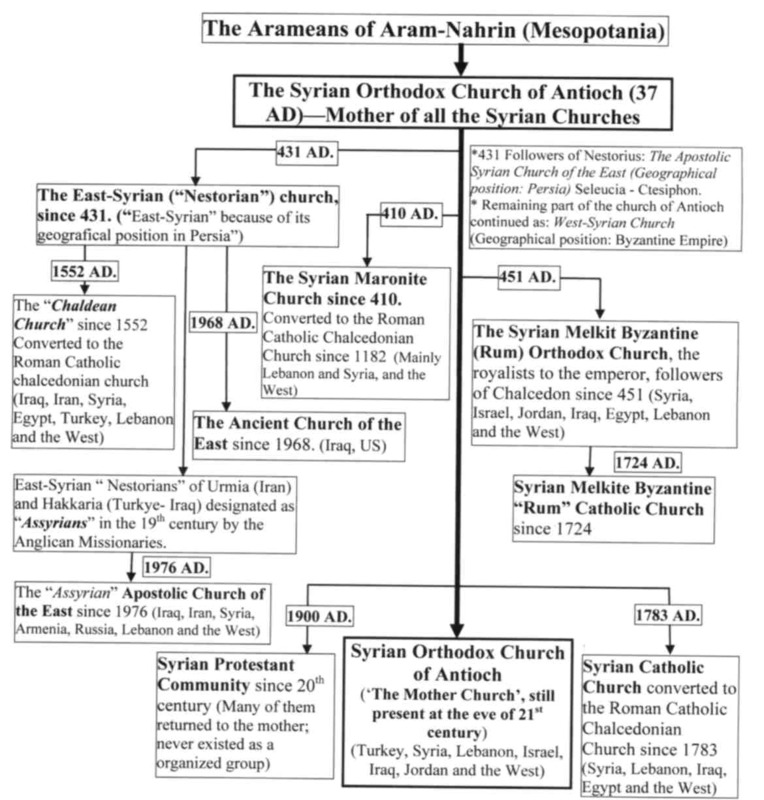 The Aramean denominations are church number 1, 2, 3, 4 ,5 ,8, 10 and 12. 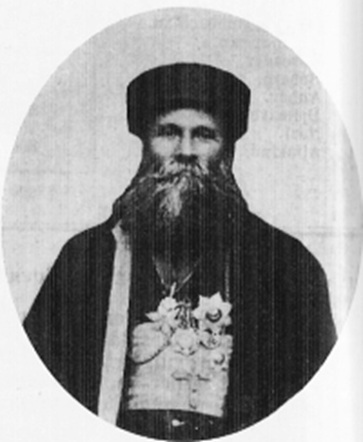 The term “Greek” does not refer to the nationality, but rather to the Aramean churches who in the 5th century adhered to the Roman (RUM) Emperor and therefore they are also called “Melkites”. 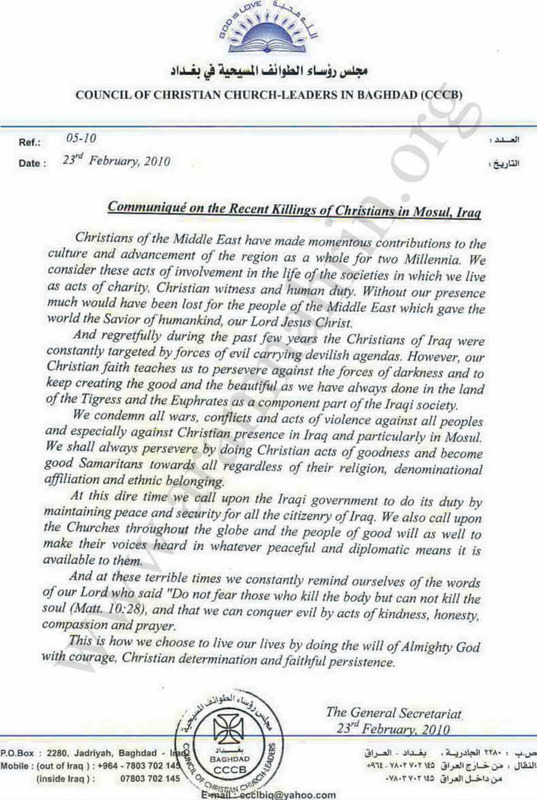 The communiqué of the Council of Churches in Iraq was issued on 23rd of February 2010. According to the last reports already hundreds of families have left Mosul. The American forces patrol in Mosul, but do nothing to prevent this happening. In Mosul there are the East- Aramean Chaldeans, the East- Aramean Nestorian “Assyrians”, the West- Aramean Syrian Catholics and the West- Aramean Syrian orthodox. In 2008 more than 12.000 Arameans were expelled out of Mosul. Some of them later came back, while others fled to the West or the neighboring countries. The number of Aramean Christians still living in Mosul is estimated between 10.000 and 15.000. Christians of the Middle East have made momentous contributions to the culture and advancement of the region as a whole for two Millennia. We consider these acts of involvement in the life of the societies in which we live as acts of charity, Christian witness and human duty. Without our presence much would have been lost for the people of the Middle East which gave the world the Savior of humankind, our Lord Jesus Christ. And regretfully during the past few years the Christians of Iraq were constantly targeted by forces of evil carrying devilish agendas. However, our Christian faith teaches us to persevere against the forces of darkness and to keep creating the good and the beautiful as we have always done in the land of the Tigress and the Euphrates as a component part of the Iraqi society. We condemn all wars, conflicts and acts of violence against all peoples and especially against Christian presence in Iraq and particularly in Mosul. We shall always persevere by doing Christian acts of goodness and become good Samaritans towards all regardless of their religion, denominational affiliation and ethnic belonging. At this dire time we call upon the Iraqi government to do its duty by maintaining peace and security for all the citizenry of Iraq. We also call upon the Churches throughout the globe and the people of good will as well to make their voices heard in whatever peaceful and diplomatic means it is available to them. And at these terrible times we constantly remind ourselves of the words of our Lord who said “Do not fear those who kill the body but can not kill the soul (Matt. 10:28), and that we can conquer evil by acts of kindness, honesty, compassion and prayer. This is how we choose to live our lives by doing the will of Almighty God with courage, Christian determination and faithful persistence. Through the initiative of the Heads of Churches in Iraq, a new council was established in the name of "The Council of Christian Church-Leaders of Iraq", which includes all of the patriarchs, archbishops, bishops, and heads of churches in Iraq, from the Catholic, Orthodox, Oriental and Protestant families, constituting 14 communities and comprised of28 Dioceses.